Recently, I have been thinking about how to avoid wasting money on unnecessary computer hardware. For computers, I think we should have one laptop and one desktop. The laptop is mostly for mobile productivity work, such as writing reports in the library or making a presentation of your project. Ideally, the laptop we have should be lightweight and low profile. However, it is very expensive to own a performance gaming laptop that is easy to carry. As for desktops, it is easier to achieve high gaming performance with lower cost. Therefore, if you really want to enjoy some PC games after productivity work, owning a gaming desktop computer is great. However, here comes the problem: If we have both laptop and desktop computers, there will be redundancy in certain components. For example, for most of the mainstream laptops, the CPU, memory, and SSD are not significantly different from their corresponding desktop components. What makes the desktop computer the de facto gaming option is the capability of using graphic cards. Therefore, in order to not to waste money on buying two computers, one could just buy a laptop computer and a console. If you do not think buying a gaming console is a good idea, then you can just build you own external GPU. The materials you will need to buy include the Thunderbolt to standard PCI Express adapter, a desktop PSU, and a desktop grade graphic card. Yes, you still have to get a desktop PSU to power your external GPU, and you definitely prefer to buy a budget one to save some bucks. 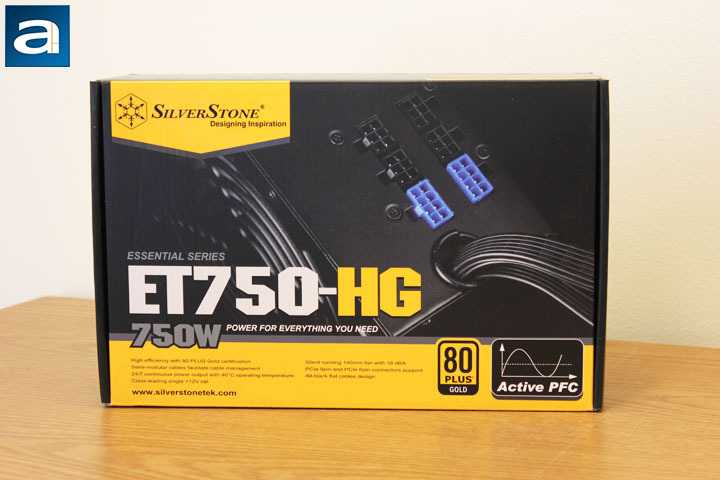 For today’s review unit, the SilverStone Essential Gold ET750-HG 750W, it is not a costly PSU. Will it be a good choice for either traditional desktop computer build or a do-it-yourself gaming box build? Let us read on and find out. Today’s review unit was shipped from Chino, California, USA to us here in Calgary, Alberta, Canada. Chino is the location of SilverStone’s office in North America. 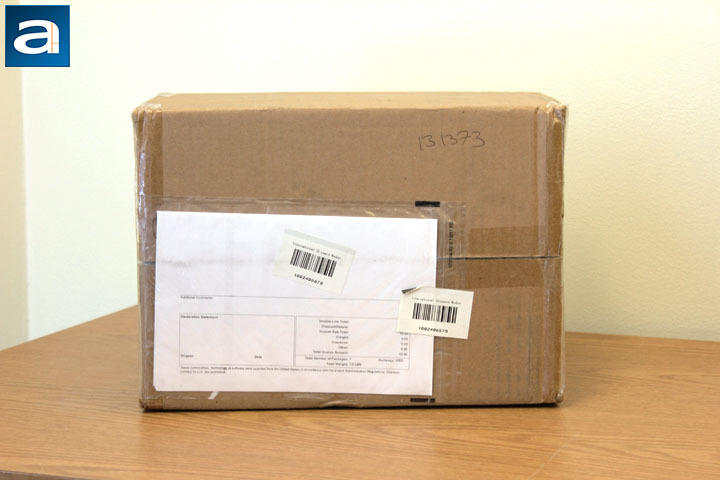 You can see the parcel is generally in good shape, therefore there is no need to be nervous about the safety of whatever is inside the box. After more than a thousand miles of transportation, I can only see a small dent on the top left corner, so well done, UPS. The service used was the Standard service. After pulling the review unit out of the shipping box, we can get a closer looker at the retail package. The overall design of the package is quite standard. You can see a SilverStone company name and logo printed on the top left side of the box. A photo of the power supply unit is shown in the middle of the box. Interestingly, it is not a full view of the product, while you can still get the idea it is a semi-modular power supply unit thanks to the cables in the picture. 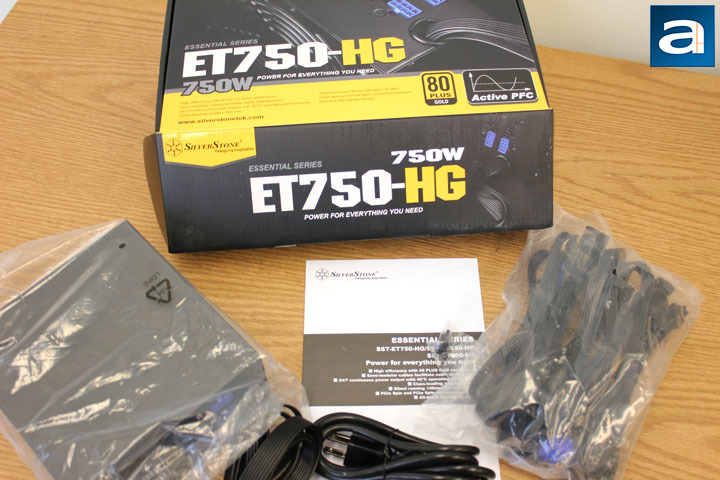 Right below the product photo, there is the “ET750-HG 750W”, which indicates how much power it can deliver. An 80 Plus Gold certified label is on the right side of the product’s name. All the features of this power supply unit are located at the bottom of the box. Generally speaking, the retail package design does its job. By just glancing at the package shortly, customers can easily find the most important information about this product, its form factor, and supported power output. Opening the box, you can see all the things you would expect from a power supply unit package. There is a power supply unit itself and a set of accessories. It is worth mentioning inside of the box, the power supply unit is wrapped by a plastic bag, and it is protected by two pieces of foam brackets. Since it is a semi-modular power supply unit, detachable cables are provided. There is one booklet provided, and it shows the installation instruction and other useful information you may need to use. You can also find a bag of screws for you to install it in your computer case that supports the ATX form factor. posted 5 hours and 47 minutes ago, with 56 posts.